What is the responsibility of Catholic school teachers with regard to the spoken and lived representation of Catholic moral values? Pope Emeritus Benedict XVI’s 2009 encyclical Caritas in Veritate is a helpful point of departure for some Labor Day observations about the recent contract negotiations between the San Francisco Archdiocese and its unionized Catholic high school teachers. Let me preface this commentary by underscoring my own desire for Christian unity and the need for charity and truth to achieve it. Institutional structures—e.g., employee handbooks and collective bargaining agreements—require responsible institutional participants. This is the case in churches, businesses, government entities, unions, schools and, in a less formal case, families. Caritas in Veritate means “charity in truth”; in effect, to believe that “God is Eternal Love” and “Absolute Truth” means that charity and truth are inexorably linked. Pope Benedict XVI teaches that we discover truth within the foundational awareness of charity, and charity can authentically occur only within the presence of truth. The Church must necessarily speak on social questions such as the right to life, the family, marriage, racism, immigration, and work life as part of its mission, and therefore the teaching of Catholic morality at its schools and other institutions will always address the lives of Catholics and all men and women of good will. How do Catholics fully become the people God calls them to be? How do they help others to achieve that same end? Caritas in Veritate begins by stating, “Each person finds his good by adherence to God’s plan for him, in order to realize it fully: in this plan, he finds his truth, and through adherence to this truth he becomes free (cf. Jn 8:22)”. Catholics are taught that each person has a call and, while others may not believe in God, we recognize by our common humanity that every person has human dignity and a purpose in his or her life. In the first few paragraphs of Caritas in Veritate, Benedict XVI points out that unfortunately, in this era, “charity” has often lost its meaning because it is detached from God’s love, and truth has become relative for many men and women. Modernists—the intellectual pace setters for culture—mistakenly believe that love is what people decide it is based on their autonomous feelings, and that the only “truth” is one’s own ego and desires, or, in other words, the absence of objective truth. The influence of modernism, “post-modernism,” and “deconstructionism” on liberal, higher education is undeniable to anyone who has studied and especially taught in U.S. colleges and universities. What is taught in higher education inevitably filters down into what is taught in secondary and primary education, where the formation of the next generation really occurs. The Catechism of the Catholic Church, quoting Dei Verbum and St. Irenaeus, states: “In order that the full and living Gospel might always be preserved in the Church the apostles left bishops as their successors. They gave them ‘their own position of teaching authority’” (par 77). It is by obligation and responsibility that Archbishop Salvatore Cordileone has sought fidelity to Church teaching in the Catholic high schools, and for that matter, in all of the other Catholic educational institutions of the archdiocese. In the area of personal morality, one would expect Catholic administrators, faculty, and staff to teach and adhere to the morality of the Church even if at times failing in their own right. To promote views or to intentionally live a public life in a manner contrary to the Church’s teaching, while, at the same time, representing one’s institution and one’s self as Catholic, is to reject the mission and vision of the Church. Such a living witness of contradiction also denies students and their parents a right to clear teaching and witness about Church teaching on fundamental moral truths, and to dismiss the teaching authority the bishop has received through apostolic succession. Another proper way of viewing this matter is that the Archbishop is simply trying to ensure consumer protection. All other employers and organizations would expect workers and members to embrace their service, product, or organizational purpose. In the case of the aforementioned morality concerns, the teaching of the Church remains valid for anyone with eyes to see and ears to hear, and the overt rejection of the teaching requires a response. Furthermore, in a social media world in which everyone has become a public figure, a morality clause at Catholic schools is not unreasonable; professional athletes and others lose contract agreements due to statements and actions that are unbecoming to the companies, products, and associations they endorse. If we wish to proceed securely in all things, we must hold fast to the following principle: What seems to me white, I will believe black if the hierarchical Church so defines. For I must be convinced that in Christ our Lord, the bridegroom, and in His spouse the Church, only one Spirit holds sway, which governs and rules for the salvation of souls. For it is by the same Spirit and Lord who gave the Ten Commandments that our holy Mother Church is ruled and governed. (The Spiritual Exercises of St. Ignatius, Louis J. Puhl, SJ, The Newman Press, 1951). Ignatius’ rule was written in the midst of the Protestant Reformation in the 16th century, and it is not without meaning for Catholics in the secular world of our 21st century. Moreover, should any person of good will, believer or non-believer, Christian or non-Christian, reject a search for truth or reject fidelity to it? Pope Benedict XVI understood that truth will not permit a charity based on emotionalism that disregards social and intellectual analysis, or accept a fideism that fails to recognize our common, universal nature as human beings. The Catholic Church continues to seek the truth by faith and reason, and the Archbishop of San Francisco is following this path as his role requires. 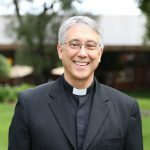 This commentary addresses the collective bargaining between Catholic high school faculty and the San Francisco Archdiocese, a fuller discussion would necessarily include, for example, arguments supporting the Church’s teachings about the sanctity of marriage and an openness to new life in marriage. Suffice it to say that following one’s individual conscience is only faithful and fulfilling when it is a well-formed conscience. In the present age, one’s individual, autonomous freedom has become the standard for moral judgments, while one’s receptivity of “what is”, or the truth of things, has been discarded. Correctly understood, however, men and women of reason and good will commit themselves to each other in marriage, recognizing the dignity of each other as subjects (not objects) in a relationship of complementarity, and true freedom occurs in both the marriage decision and the marriage itself. Furthermore, marriage between a man and woman is the only social institution that protects the right of a child to a mother and a father. Without playing language games, we can agree that we all come from a father and mother, and that committed husbands and wives with responsible child bearing and rearing practices are necessary for the common good. Christians, whether Catholic and non-Catholic, have always experienced a tension between the realities of an imperfect world and the life they are called live in friendship with Jesus Christ. Catholics who embrace their faith, coming to know it deeply, will experience trials and tribulations because of its demands. The Catholic philosopher Charles Taylor explains in The Secular Age (Harvard University Press, 2007) that a “radical secularity” has created a widening separation between children and their fathers and mothers. He also concludes that “medicalization,” an objectified science, has separated virtue from knowledge. This leads to self-centered views on sexual ethics, reproductive technologies, and one’s respect for life itself. Taylor repeats what others have pointed out before, that is, in a utilitarian and individualistic world view focused on pleasure, sexual behavior is easily separated from one’s capacity for good intentions. And yet there is something extraordinary about their lives [the lives of Christians]. They live in their own countries as though they were only passing through. They play their full role as citizens, but labor under all the disabilities of aliens. Any country can be their homeland, but for them their homeland, wherever it may be, is a foreign country. Like others, they marry and have children, but they do not expose them. They share meals, but not their wives. Notice the emphasis on the “lives” of these Christians, and that others primarily recognized the distinctiveness of Christianity by their living witness to Gospel values. Clearly, one’s living witness is critical to the teaching efficacy of the Church. When Catholic teachers and administrators live lives intentionally contrary to Church teaching, they directly undermine the Church’s mission, and ill-serve their students and their families. In Caritas in Veritate Benedict XVI recalls the importance of labor unions in society and their contribution to the cooperation of the human family. He challenges labor unions to move beyond the interests of their particular industry and profession, and to consider the relations between consumers and workers. Similarly, given the reality of globalization, national labor unions should consider the needs of workers whose social rights are often denied in less developed regions. A desire by labor unionists to serve outside of their particular segment of an economy or industry will underscore labor’s “authentic ethical and cultural motivations” for the support and development of others. 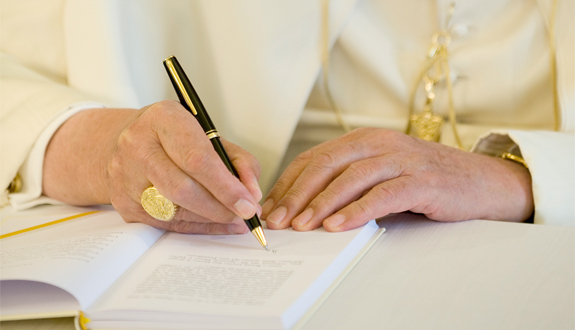 He finally reminds Catholics that the Church has wisely made a distinction between the roles of unions in civil society from the role of politics in society (#64). Benedict XVI reviews the work of other professions and economic activities; for example, pointing out the misuse of finance in the wake of the Great Recession and calling for financial experts “to launch financial initiatives in which the humanitarian dimension predominates.” He furthermore reminds the reader that “the consumer has a specific social responsibility which goes hand-in-hand with the social responsibility of the enterprise” (See #64, #65 and #66). Associations of every kind, and especially those of working men, are now far more common than heretofore. As regards many of these there is no need at present to inquire whence they spring, what are their objects, or what the means they imply. Now, there is a good deal of evidence in favor of the opinion that many of these societies are in the hands of secret leaders, and are managed on principles ill-according with Christianity and the public well-being; and that they do their utmost to get within their grasp the whole field of labor, and force working men either to join them or to starve. Under these circumstances Christian working men must do one of two things: either join associations in which their religion will be exposed to peril, or form associations among themselves and unite their forces so as to shake off courageously the yoke of so unrighteous and intolerable an oppression. No one who does not wish to expose man’s chief good to extreme risk will for a moment hesitate to say that the second alternative should by all means be adopted” (See #54). By the 1970s, U.S. labor unions, reliant on the political support of Democratic politicians, had fallen further into the cultural relativism of the time. Over the next decades one finds labor unions supporting abortion and endorsing initiatives and legislation that weaken the traditional family and disregard the rights of children to a mother and father. All levels of education are rapidly changing in this Information Age. Mothers and fathers have more options for their children; many well-educated, practicing Catholics are now educating their children at home. Curriculum, teaching resources, and other educational support are offered online. The transport company UBER is challenging the taxi industry, and online education will unquestionably challenge schools as we know them. This is an exciting time for Catholics who wish to teach the faith; it provides choices for families, and parents will search out educators who teach what the Church actually teaches. It is also a good time to discuss the identity of Catholic schools, and organized teachers have an opportunity, with the shepherds of the Church, to make Catholic education available to as many Catholic families who desire it. Because it is filled with truth, charity can be understood in the abundance of its values, it can be shared and communicated. Truth, in fact, is lógos which creates diá-logos, and hence communication and communion. Truth, by enabling men and women to let go of their subjective opinions and impressions, allows them to move beyond cultural and historical limitations and to come together in the assessment of the value and substance of things. 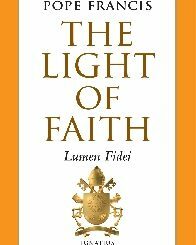 Truth opens and unites our minds in the lógos of love: this is the Christian proclamation and testimony of charity. In the present social and cultural context, where there is a widespread tendency to relativize truth, practising charity in truth helps people to understand that adhering to the values of Christianity is not merely useful but essential for building a good society and for true integral human development. A Christianity of charity without truth would be more or less interchangeable with a pool of good sentiments, helpful for social cohesion, but of little relevance. In other words, there would no longer be any real place for God in the world. Without truth, charity is confined to a narrow field devoid of relations. It is excluded from the plans and processes of promoting human development of universal range, in dialogue between knowledge and praxis (See #4). First the Kentucky clerk; now the Oregon judge?